When photographing weddings, we are always looking for the quality of the light & how it will impact the image. Whether it is sunlight pouring in from an archway, candlelight from a reception table, soft filtered light through a window, or artificial light created by our flash, we are always trying to use that light in the most interesting and flattering way. In this image, the couple were waiting in the shade away from the bright and hot mid-day sun. The light streamed in from the balcony to illuminate the bride's face and dress as she laughed with her groom. 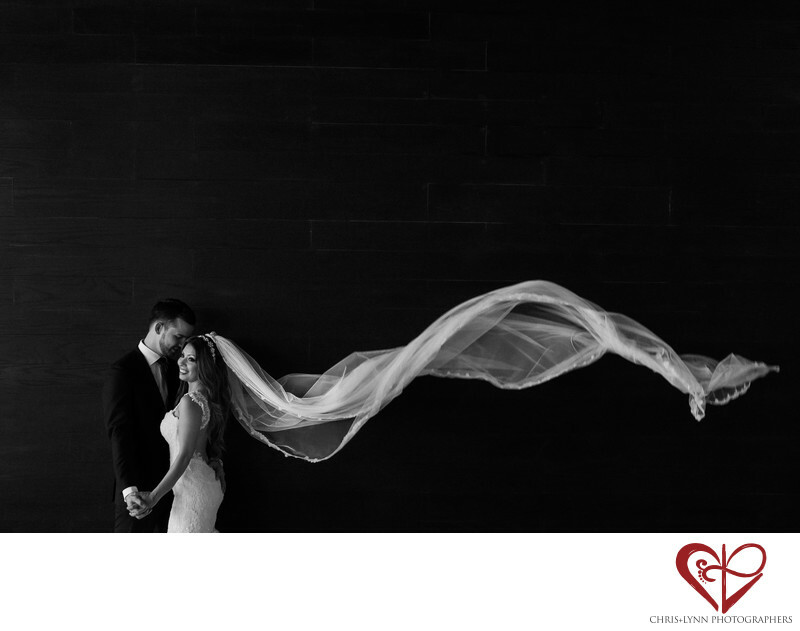 Against the simple but dramatic black backdrop of the hotel lobby wall, the white of her dress and veil simply popped! When the unexpected happened - a big gust of wind off the ocean - it blew the veil up creating an instantly dramatic moment. We love long veils precisely for this reason! And being ready to anticipate and react to these types of impromptu moments is key to being a great wedding photographer. This image is also a favorite due to its versatility - it would make a dramatic double-page spread in the couple's wedding album, or as a large 20x30 print for the couple's living room wall. Location: The Cape, a Thompson Hotel, Carretera Transpeninsular Km 5, Misiones del Cabo, 23455 Cabo San Lucas, BCS, Mexico .